Even though work has exploded again I am managing to make it to the Green Market and to cook all of the fresh produce I am buying. Last summer I did not have time to take advantage of the super short growing season and I am determined not to let than happen again. Apricots, blueberries, sugar snap peas (the last of the season), fresh corn (the first of the season), potatoes, broccoli, cabbage, tomatillos, dried black beans, chives, cilantro, cremini mushrooms, and garlic. Most of it has been prepped and will feed me for the coming week. Two weeks ago I scored the first of the summer apricots and I was quite excited. I never cared for them as a child but that is mainly because the few times I had them they were dried and too tart for my child's tastebuds. Over the years I developed an appreciation for them (apricot preserves went a long way towards that newfound appreciation), but I was never tempted to buy them when I saw them at the grocery store finding myself usually disappointed with stone fruits purchased at conventional grocery stores, so I never had them fresh. A few years ago I finally decided to try them when I saw them at the Green Market. They looked so fresh and rosy that I could not resist. And I discovered that there is nothing like a fresh, ripe, juicy apricot just off the tree. Since then I wait impatiently for fresh apricots to show up and then I consume as many as I can during the brief season. One of the main ways I have eaten them in the past was with blueberries in my morning yogurt. But I stopped eating yogurt regularly earlier this year. So instead I decided to do something I have not done very often, and rarely just for myself. I decided to make fruit salad. One reason I hardly ever make fruit salad for myself is that so many of the fruits that go into it do not hold up well as leftovers. Bananas and grapes get slimy, apples get brown (even with lime or lemon juice sprinkled over it), and nectarines and apricots get mushy in the lemon or lime juice. What I tried this year has been successful so far. 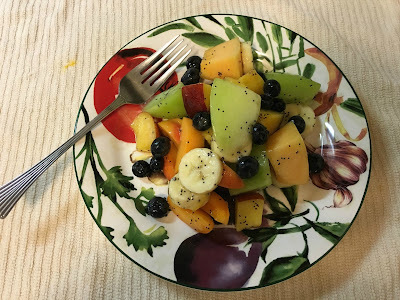 I precut the fruits that can hold up and store them together in the refrigerator, and then when I am ready for a fruit salad I will add the other fruits, So the banana and grapes do not get slimy, the apple does not brown, and the nectarines and apricots don't turn to mush. It is not that much extra work and I have been enjoying fruit salad all month. Without some kind of dressing, however, it is juts a bowl of chopped fruit. 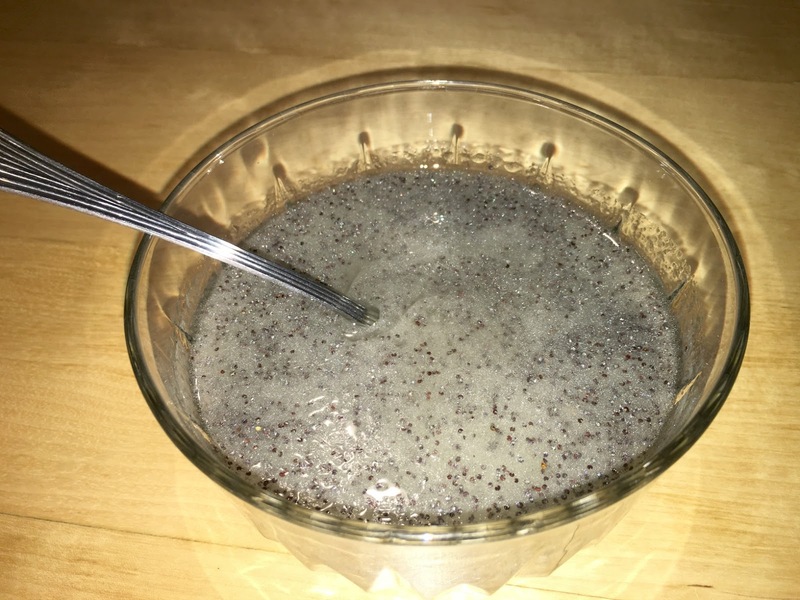 I remembered that when I was younger my mother would sometimes buy a poppy seed dressing when she was making fruit salad for a dinner party. And then I remembered that at some point I had a recipe for homemade poppy seed dressing. I remembered it being especially delicious with fruit salad so I want looking for the recipe. Unfortunately, I could not find it. But a quick internet search led me to several that seemed much like what I remembered. The one that I found at Kitchn looked the most promising so I whipped up a batch and have been loving it with my fruit salad. It has the perfect balance of acid and sweet to complement the sweetness of the fruit. It would also work well with any other kind of salad. If you are looking for a new way to dress up your salads, this is a delicious way to do it. *Any single or combination of oils can be used for this dressing. If using olive oil, the dressing will solidify in the refrigerator but it will go back to normal at room temperature. Combine the white wine vinegar and the sugar and mix until the sugar has dissolved. Grate the shallot into the mixture, then add the poppy seeds, salt, and the ground mustard. Whisk to combine. Slowly pour the oil into the mixture, whisking continuously, until an emulsion forms. Store the dressing in a jar in the refrigerator. If it separates, shake well before using.